Congratulations to our high school seniors who will be entering college this fall! Romain Cannone will attend Sacred Heart University and fence for their Div I team. Romain started training at age 12 with Coach Misha Mokretsov. In the last two years, Romain fenced for the French cadet and junior national teams and ranked number 1 in France in juniors and number 3 in the world in cadets. He won gold medals in the 2015 European Junior Team Championship, the 2014 Bratislava European Cadet Cup, and the 2014 Virginia Junior North American Cup. He has been selected to the 2015 French junior world team. Romain is a senior at John Jay High School in Westchester. Skyler Chin will attend Yale University and fence for their Div I team. Skyler also began training at age 12 with Coach Misha Mokretsov. In his second season, he reached number 2 in US rankings and earned an A rating. Medals include fifth in the 2014 Junior North American Cup at Summer Nationals, silver in the 2011 Div II National Championships, and bronze in the Y14 National Championships. Skyler is a top scholar-athlete at Great Neck South on Long Island where he was a 6-time varsity letter winner, Nassau County Champion, and team captain in his junior year. Romain and Skyler have always been part of NYFA and it’s hard to imagine our club without them. They are among my first generation of athletes who are successful fencers and who always remained loyal and believed in our club when it was very young, with no established results or students. They are leaders by nature and they’ve demonstrated to our younger fencers that perseverance and consistency in training pay off. They may have different personal goals, but both have achieved greater accomplishments than merely being the best in the club. 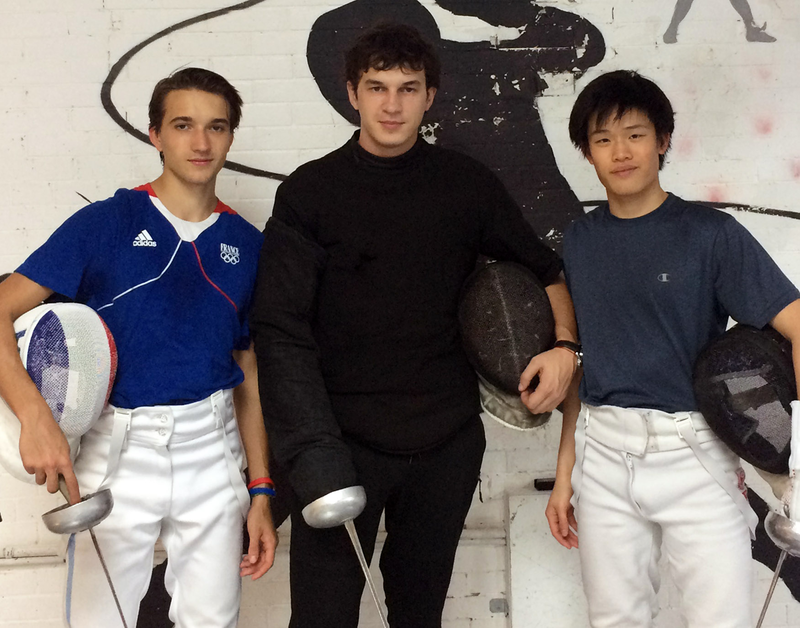 Now they are among the best young fencers in the US that have earned their spots in top colleges. I’m very proud of Skyler Chin, who, despite the limitations on his training due to injuries and the long distance from our club, managed to earn several national medals including a Junior finalist medal in the largest Summer Nationals NAC, and he got recruited to one of the best colleges in the world – Yale University! We wish him successful and fun college years as he continues to work hard in pursuit of his future goals, which may include NCAA titles. Romain Cannone, despite his young age, is already a European Champion and on the road to getting his World title. He has a very challenging schedule due to such high fencing goals he’s established for himself, constantly traveling with very little time for other fun. I remember what it was like on my National team and those years were the most interesting and fun years in my life – seeing different countries and cultures, making friends all over the world and the happiness of victories are precious memories that will stay with me all my life and will inspire me for coaching for many years ahead. I’m sure Romain will agree that those years were worth every effort! Romain is going to Sacred Heart University which is not too far from our club and will allow him to continue to pursue his fencing goals while getting his degree. I believe you will hear more about his fencing achievements in the next couple of years as he still has two more years in juniors. I wish both our star fencers good luck and fun in college, and NYFA will always remain their second home! Here is a list of NYFA fencers and the colleges they are attending.